I was driving down the Broad Street on Sunday when all of a sudden I had to pull over abruptly in the center “parking lane.” My friends, Forest and Ben were playing guitars in front of the library at Broad and Morris! It was a beautiful morning and these beautiful people were making some beautiful music in Circle of Hope Broad and Washington’s beautiful neighborhood. I made a video of it. Happening upon them where I found them was really cool because we had just been there the Sunday before at the AMPM (the morning Public Meeting designed to include children and family. We played games, ate snacks and told stories in DeSilvestro Playground (behind the libray). Here’s another video of Tracey and Moses telling a story about peace making goats in English and Runyankole (from Uganda). That’s what we’re doing, friends. That’s what Jesus is offering: Peace in the midst of crazy, uncomfortable stories and joy all over the place–the kind of peace that get’s noticed if we give Jesus the opportunity to get out in public by getting us on the street, especially right in our neighborhood and it’s “Main Street”, South Broad Street. I remember seeing these weird stickers and spray painted stencils of Andre the Giant when I first moved to Philadelphia in 1996. I was just a kid and Circle of Hope was just an idea. Now Shepard Fairey’s OBEY design is almost 25 years old and it’s on a T-shirt worn by what seems like 1 in 10 of the college kids I’m seeing these days, and Circle of Hope is very much more than an idea and into it’s 17th year. I’d like to see these parallels converge a bit more as I work to develop our mission. Shepard Fairey is a subvertiser. He’s managed to get really mainstream which is sort of weird but he’s one of the most well known subvertisers I know of. 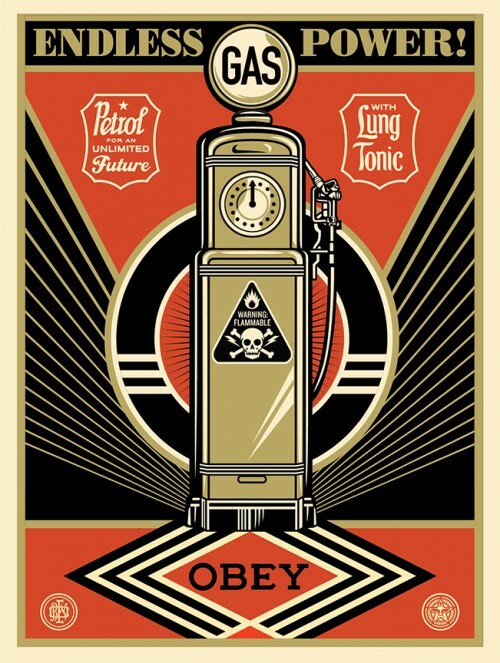 Wikipedia’s article about subvertising says “the key process involves redefining or even reclaiming one’s environment from a perceived corporate beast.” I don’t know if Shepard would be so direct but one of the recent designs on his website obeygiant.com speaks that sort of language. He takes an obvious message- “we are going to run out of gas” and makes it look cool. He puts a funny mustache on the image of the emperor and it sells like hotcakes. I do believe that he is not at this just to get rich (I think he’s doing that though) but he’s also hoping that his message is noticed on the shirts of all those college kids regardless of why the individual is wearing it. Jesus is interested in reclaiming our environment from the corporate beast too, so I think we ought to figure out how to do it. Of course we wouldn’t advertise (some of my friends in Circle of Hope can’t even stomach saying the word in the context of our mission) but we would subvertise and we ought to think hard about how to get our name and even our “brand” associated with resistance and restoration, questioning the powers that be, and liberation from oppression. This is the message that is resonating with those who are buying the OBEY brand if only subliminally for some. We want to do more than wear T-shirts though. We want to supplant advertising and fuel the rebellion that Jesus is leading. Another thing that I think is interesting about Shepard’s ideas is his popularization of the phrase “the medium is the message.” It was introduced in Marshall McLuhan’s most widely known book, Understanding Media: The Extensions of Man, published in 1964. Though not exactly a corollary, our incarnational approach to evangelism is akin to McLuhan’s and Shepard’s idea. Our medium for transmitting the gospel is the community. We are the gospel as much if not more than we preach it. This has it’s roots in Anabaptist theology, yes, but more so in the message and modus operandi of Jesus. He said, “I am the Way” –it’s me. He went around preaching about other things too but he makes it clear in all four of the gospels that the most important thing is not a thing or idea at all–He’s Jesus. The promise from Jesus is “trust in me and I will give you all I have from the Father, including eternity.” When I say “we are the gospel” I’m not supplanting Jesus but I am being like Him. No, I am not the Way but I believe the best way to communicate Jesus to those who do not yet know Him is to invite them into a way of being. We say “We create an environment where people can connect with God and act for redemption.” The medium, us as followers of Jesus and temples of the living God, is the message. Unfortunately, just being who we are does not suffice in a world of noise and isolation. If anyone is to be exposed to who we are we’re going to have to be conspicuously. I think a really good way to do that is subvertising. Let’s supplant advertising by using the medium, speaking the first language of our consumerist culture and see if anyone will notice. I’m praying they will. Circle of Hope has a Street Team led by Luke Bartolomeo who designed this cool stuff. We’re interested in these ideas. Would you like to join us? Let me know. Don’t you think that Circle of Hope is a perfect place to dedicate your energy and creativity to Jesus? Ok, you’re not that religious or you’re not that religion’s religious, but you do have energy and creativity and you’re looking for a way to use it aren’t you? Why not Jesus? It’s a real shame that the Church has been co-opted by the institutional passion-sappers of our society. I don’t blame you for being suspicious, especially if you have a bad experience with the church or some pseudo experience with a pseudo church person (like on TV). It’s a real shame that our prophetic voice has been silenced by things like student loans, international threats and fears of international threats (and threats of fear of international threats). That which cows us under the pressure just to make it is that which we need to make our lives about unmaking. It’s a real shame too that we’ve made it rude to talk about Jesus anywhere but in a Church’s building. My private faith is meaningless. When we trapped it in our heads we cut our own capacity to transform the world right out from under ourselves. But Jesus is saving me from shame, so I’ve been working on having real experiences, unmaking ungodly powers, and being so rude as to talk about Jesus in public. I went to a bunch of student activities fairs on your campuses this week (Philadelphia University, uArts, Penn and Eastern). Here’s a picture of me and Jonny at one today. I was struck at how many of you (students) were interested in Jesus’ mission in the world. Some asked me what we do in Circle of Hope and I said we resist and restore. We say “Jesus is living the greatest mutiny ever – we should not waste our rebellion on each other.” Too many of you have seen us wasting our rebellion on each other. Let’s turn our focus on those forces which are hellbent on dominating us. We have a common cause. I’m offering you a common community and a common hope. The safest thing to do is to keep your head down and fit into the tiny space the economy has carved out for you. Life with Jesus is not necessarily safe, but it is worth your life’s devotion– all your energy and creativity. Circle of Hope is looking for you as a partner. We will be safe for you to explore while you’re figuring it all out. But if you get next to Jesus, you can expect an adventure at the least, a life worth living that is a threat to all that oppresses at the most. Call me back. I’m on your phone I’m at your door. Find me, I’m looking for you.